Lab World features a huge range of products, and the great thing about many of them is that they can be combined to carry out a number of interesting and enlightening experiments. One of the most interesting and useful products is the Electron Deflection Tube D, and when combined with the pieces of equipment listed below you have all you need to carry out deflection experiments and learn all about the behaviour and properties of electrons. Electron deflection experiments using a deflection tube allow the user to determine the specific charge e/m and the velocity of the electrons. The electron beam can be deflected electrically, and magnetically by using Helmholtz coils, which are included in the experiment kit. The Deflection Tube D comprises a highly evacuated electron tube, an electron gun and a fluorescent screen. These are set at an incline relative to the beam axis so the beam's path is rendered visible and the effects of electrical and magnetic fields can be examined and studied. The electric field can be adjusted to cancel out the magnetic deflection, which is how the charge and velocity of the electrons can be determined. The Helmholtz Pair of Coils D creates a uniform magnetic field, and allows the electron beam to be deflected magnetically. When the electric field is adjusted to cancel out this magnetic deflection, properties of the electrons can be calculated. As the name suggests, the Tube Holder D is essential for holding your Electron Deflection Tube D in place. Durable and robust, it ensures that the tube is in the perfect position. This experiment kit contains three power supplies; 2x High Voltage Power Supply 5kV (230V, 50/60Hz), and 1x DC Power Supply 0 - 20V, 0 - 5A, giving you all the energy you need to carry out this experiment. If you need a little help setting up all your kit, or want to save some time, why not check out this handy video? If you want to get started on your own electron experiments then head over to the product page on Lab World. 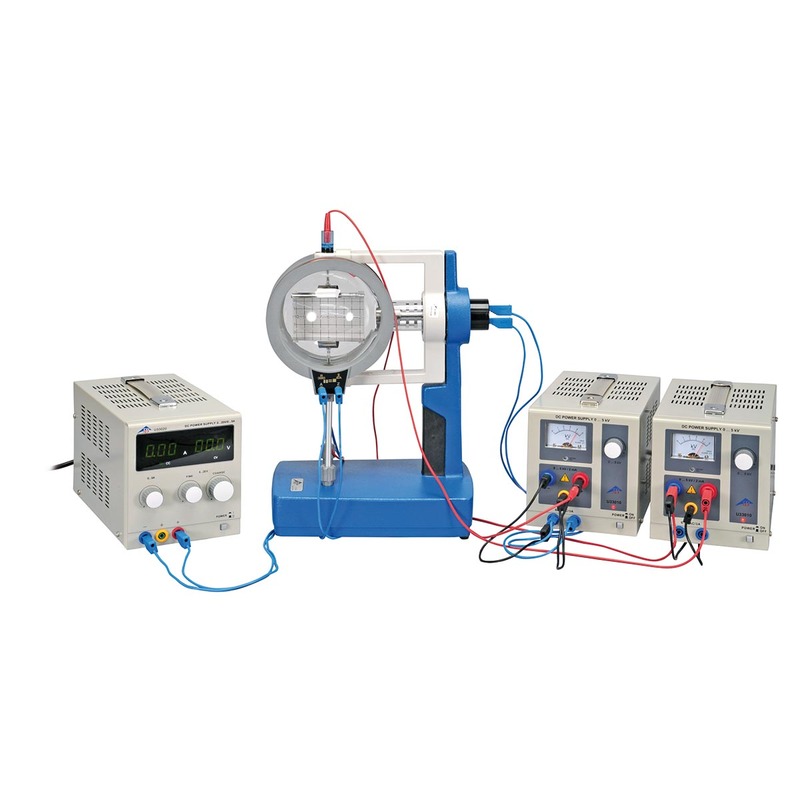 Click here for the Electron Deflection Tube D Experiment Kit.